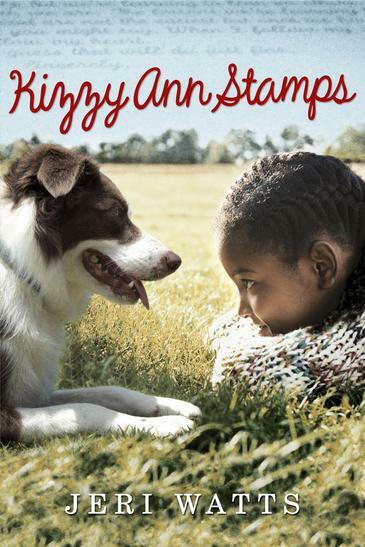 Taking things in stride is not easy for Kizzy Ann, but with her stalwart border collie, Shag, at her side, she sets out to live a life as sweet as syrup on cornbread. In 1963, as Kizzy Ann prepares for her first year at an integrated school, she worries about the color of her skin, the scar running from the corner of her right eye to the tip of her smile, and whether anyone at the white school will like her. She writes letters to her new teacher in a clear, insistent voice, stating her troubles and asking questions with startling honesty. The new teacher is supportive, but not everyone feels the same, so there is a lot to write about. Her brother, James, is having a far less positive school experience than she is, and the annoying white neighbor boy won't leave her alone. But Shag, her border collie, is her refuge. Even so, opportunity clashes with obstacle. Kizzy Ann knows she and Shag could compete well in the dog trials, but will she be able to enter? From newcomer Jeri Watts comes an inspiring middle-grade novel about opening your mind to the troubles and scars we all must bear-and facing life with hope and trust. I read a review for this in Magpies magazine, and I downloaded the eBook straight away (That is one of the best things about digital books). The book is only out in hardback in Australia, but it really is a stand out, so try and get your hands on it one way or another. Most of us would be aware of, and many of us would have read the book, The Help by Kathryn Stockett, this book is a child’s eye view of the same time in history, the American South in the early 1960s. Kizzy has to start a new school, the white school, now to be an integrated school. She has been asked to write to her new teacher, to tell her a little about herself. To Kizzy’s surprise her teacher replies, and so begins an exchange of letters in which Kizzy tells her story and reveals her fears about starting the new school and shares her dreams for her future. The tone of this story is perfect, conversational, easy to read and difficult to put down. We only read Kizzy’s letters to her teacher, but we find out a little about the teacher too, by what Kizzy is writing in reply. The colour of her skin is not the only reason people tend to stop and stare at Kizzy, she has a nasty scar running across her right cheek. There's a story about the scar too, which is revealed during the course of the letter writing. The other main character in the book is Shag, Kizzy’s dog. Kizzy may not have many friends, but she does have a wonderfully loyal dog, who is always by her side, and helps her through some tough times. Many of the folks in this rural Virginian town may not like the idea of black kids going to their school, but they can’t help but admire and fall in love with Shag. So it’s Shag that helps bring about the beginnings of change in the community and makes Kizzy’s life just a little bit easier. I just love Kizzy, she is a great character. She’s feisty, smart, opinionated, articulate and proud. She is not afraid to speak her mind, even if she gets the switch for it!